It’s been more than a year since I last posted. Why am I posting now? It’s got something to do with the photo of the Beatles circa 1969 on the big billboard some 100 feet from my loft. I see it every day, and it’s like an instant trip in a time machine. I did a Google search to find out more about the image and found a good writeup on the LA Times’ site (co-written by Patrick Goldstein, whom I remember from back in the day!). But I didn’t need to know the who, what, where, when or why of the photo session to analyze the sense of poignant nostalgia I get every time I look at the billboard (which, given its location, is pretty much any time I go anywhere). The guys in that picture look so young and indestructible. And now, two of them are gone forever, and Ringo and Paul (I will never call him Sir Paul) have aged–maybe more gracefully than me, but they will never again be the idols of my teen years. Just one more reminder that I am getting old, too. I have to admit that I did buy the Beatles boxed set on iTunes and have begun listening to the albums (I’m most partial to the Help/Rubber Soul/Revolver period). It’s actually comforting in a way the image isn’t: The music, unlike the people who created it, is eternal and for me, at least, sounds as fresh and exciting as it did all those years ago. Overall, I’m really glad the Beatles are finally on iTunes. And I’m not unhappy that Apple is working hard to push them, even if the marketing campaign does remind me of my mortality. If we Baby Boomers are lucky, maybe it will also remind those that weren’t around in those days that we were once young and cool, too. I spent the day at Finovate2009, a conference where companies with innovative web-based financial products and services strut their stuff for an audience of potential customers, analysts, and reporters. I’ve covered personal finance and accounting software for years, and watching its migration to the web is fascinating: You don’t hear much anymore about the privacy concerns that once dogged anything to do with accessing financial information online, or entrusting it to a Web service. The clearest trend of the day: Business models that depend on financial institutions to pay for consumer-facing services. It seems that few firms expect to make money from consumer fees, ads or marketing offers. The services themselves were all over the map. I was particularly fascinated by a couple of electronic check deposit services. MShift has technology that lets you electronically deposit checks by submitting photographs (front and back) captured with any 2-megapixel or greater phone camera. Fidelity National Information Services has developed technology that not only lets consumers submit a scanned checks, but gives institutions tools to assess the risk involved in accepting the check. Is it from a valid account? Does the depositor have a history of bounced deposits? Is there anything unusual that might justify placing the funds on hold? If so, the service raises a red flag. A couple of personal finance management services designed for financial institutions to offer customers showed off nifty new bells and whistles. Yodlee will introduce a highly customizable user interface for which third parties can develop widgets; FinanceWorks (from Intuit-owned Digital Insight) will integrate with Intuit’s TurboTax to make entering tax info easier than ever. Both were among the best-of-show winners based on Finovate attendee votes. Another show winner was First ROI and BancVue’s Kasasa–basically a rewards checking program created for small community lenders. BancVue provides the technology and, perhaps more importantly, brand marketing services that these small banks and credit unions wouldn’t be able to afford on their own. I was also impressed by S1 Enterprise‘s suite of template applications that institutions can customize and offer their customers. Also present at the show were Mint.com, which is in the process of being acquired by Intuit (and is taking up residence on Yahoo’s home page), and Simplifi, which is making its financial planning and management service available to banks. A couple of companies have created applications designed to educate kids (Skill-Life’s Cents City) and novice investors (TILE Financial-TILE stands for The Investment Learning Environment). Of personal interest to me as a newly self-employed writer is Outright.com‘s free small business accounting service. Billeo flags Google and Bing search results that have special offers (e.g. online coupon codes) for something you might be shopping for. Finally, a number of companies are working on payment services. Bling Nation provides consumers with chip-equipped stickers to slap on the back of their cell phones and use, a la RFID, to make payments to merchants with Bling terminals. PayByMobile envisions a system where you’d fund an account (much the way you fund a prepaid cell phone account) that you could draw on to pay participating merchants using a SMS short code message. CashEdge’s POPMoney (for Pay Other People Money) would empower people to send and request payments using e-mail and existing bank accounts. Payments to accounts at banks participating in the CashEdge network would occur immediately; otherwise, the user would have to provide wire transfer information. I could go on, but it’s late. You can peruse the full list of presenters on the Finovate site. Have you shopped for a digital camera lately? Even for shopaholics like me, it can be a daunting experience. The choices are, quite simply, mind-boggling. Sifting through them all and trying to pinpoint the best model for your needs and budget is a Herculean task. Sites like PC World (my former employer) and CNET help, with expert reviews, ranked charts, and links to user reviews, specs, and (typically) pricing engines (to help you find the best deals on the models you’re researching). Now, however, a site called Retrevo is raising the bar on aggregating product information and packaging it in exceptionally accessible and user-friendly fashion. Retrevo isn’t brand new: It’s been gathering product data for a couple of years and providing it both on its own site and those of partners. 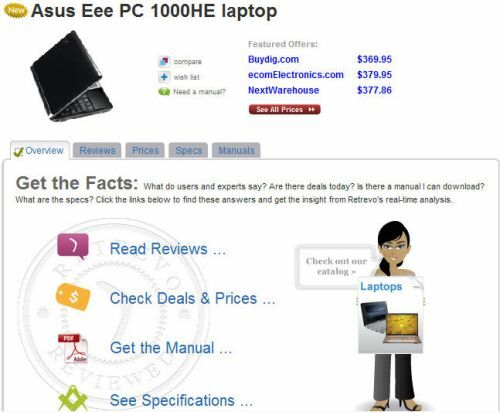 PC World’s product pages, for example, include a link to user reviews on Retrevo. But Retrevo today launched a site redesign that makes clever use of artificial intelligence and great new graphics to put a slew of potentially useful metrics at your fingertips. Major product categories now start with a Product Advisor page featuring the usual ranked chart underneath something you don’t see every day: A Retrevo Value Map that plots each product on a scatter chart (the X axis is the price, the y axis shows the value Retrova has assigned the product based on specs, user reviews, price and so forth. Retrevo representatives say these ratings change constantly as Retrevo updates the data and factors in the competitive landscape. The points plotted on the map show the ranking of the product; mouse over them to see the product names and link to their entry on the chart below, which provides the sort of info you expect on these charts (basic specs, price) plus Retrevo’s thumbs-up, thumbs-down take on the product’s overall value and how it’s viewed by users (Retrevo determines this by using AI to scan user reviews). 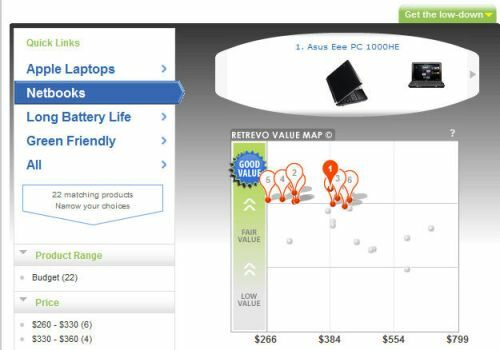 Retrevo's new Value Map plots products on a scatter chart based on their price and a Retrevo-assigned value. Tabs along the top of the Product Advisor page send you to additional useful information, including buying guides from several top sites (including PC Magazine and CNET); laptop-relevant how-to articles (I found one from PC World in this group); a user forum (called “Fans”); and a Daily Deals list of products that on sale (drawn from Retrevo’s analysis of pricing engine data). Going back to the Product Advisor chart, clicking on an entry will get you to a product page, where you’ll find links to user reviews, prices and deals, the product’s user manual, and technical specifications. Further down on the page you can even see recent forum posts, or ask a question to other users yourself without having to search around (a particularly nice feature since forums are rarely integrated with product pages). Here’s part of a typical product page. 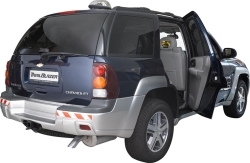 A Retrevo product page features links to user reviews, prices and deals, the product manual, and tecnical specifications. Not shown, but further down on the page, are community comments and a form for posting a question. Clicking on the Read Reviews link gets you to another key feature of Retrevo’s redesign: Rather than just going directly to the usual list of reviews, Retrevo serves up a page it calls Retrevo Real-Time Reviews, with metrics intended to answer what it deems the major questions you’d be looking for in the reviews. First, there’s a graphic that shows where the product is in its cycle (i.e., whether it’s brand new or aging) — something you can’t always tell on many sites. 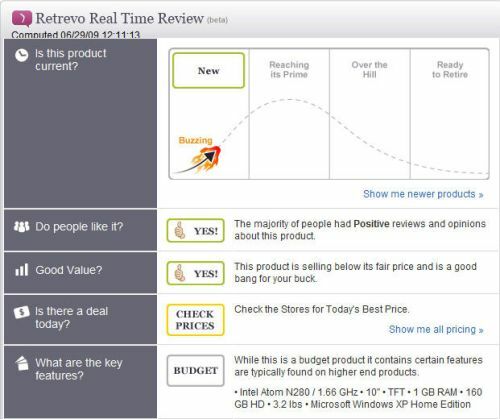 A Retrevo Real-Time Review provides good snapshot info on a product, but no human hands-on is involved. The Retrevo Real-Time Review concludes with an overall recommendation based on the aforementioned data. But it’s important to realize that this bottom-line recommendation does not come from a human being. Indeed, I find the use of the term “review” a bit misleading: Maybe because I write reviews after spending time with products, I feel you should only call an evaluation a review if a human being is involved in making the judgment. That Retrevo’s evaluation process is completely automated doesn’t make it worthless–or even unique (CNET for years has used automated evalutions based on specs, pricing, etc.). In fact, I really like what Retrevo has done to make a lot of relevant information easily accessible, especially for non-geeks who want to cut to the chase. Do I trust the under-the-hood AI to make accurate assessments? Yes, up to a point. For controversial products especially, I still would rather use my own intelligence to evaluate user comments. And I still want to read what an experienced human being has to say. But I might well start my research on Retrevo, if only because its innovative ways of presenting data should make it a lot easier for me to hone in on a few choices. If I were at PC World or CNET or any other site that reaches out to shoppers, I’d take a long hard look, because Retrevo has just gone to the head of the class on aggregation for product data. Content sharing made super-simple: That’s the pitch for some pretty impressive technology previewed in the latest beta of the upcoming version of Opera Software‘s browser (Opera 10). Called Opera Unite, it basically puts a web server inside your browser, allowing you to easily share pretty much anything on your PC via a custom URL (and a password, if you wish). All you have to do to enable Opera Unite is to sign up for an account by creating your own user ID and assigning a name for your PC (you can set up several for your account). 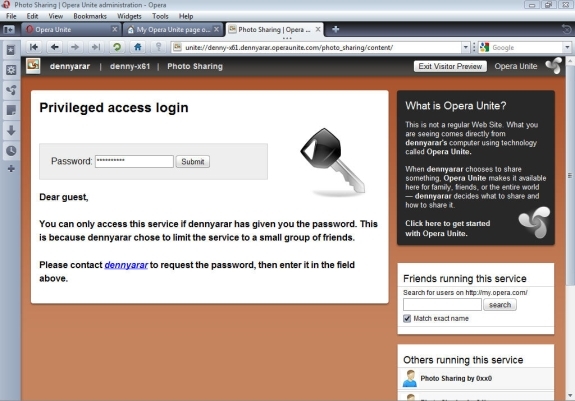 The URL for a user named denny with a PC named home, for example, would be http://home.denny.operaunite.com/. Opera Unite is not just a service; it’s a platform that Opera hopes will attract developers. 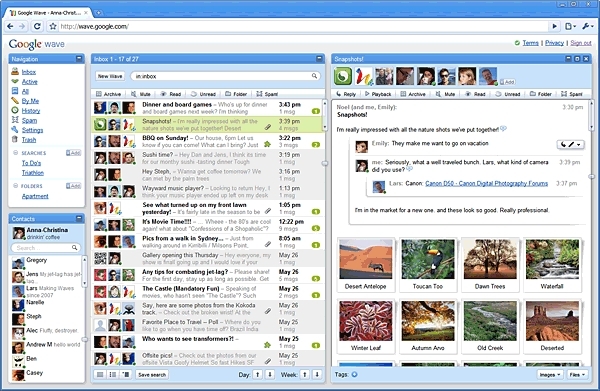 But to get you started, Opera provides a basic set of widgets, including ones for photo-sharing (without having to upload files to Flickr or other services); a chat room; a sticky-note board called The Fridge (because that’s what the interface looks like); general file-sharing; and–for the really ambitious–web site hosting. The basic Opera Unite interface, showing the Fridge widget. The Opera Unite interface for password-protected content. One potential fly in the ointment: Opera in its presentation sort of glossed over the potential for copyright problems (like the ones that killed off the original Napster and its ilk). Basically, it sounds like they’re trusting to the honor system (don’t share stuff you have no right to share). You also have to trust that Opera has plugged all potential security holes — a big question that I’m not equipped to answer. And of course, to make content available, you have to keep your PC on with Opera Unite running, so it’s not exactly a practical alternative to professional web hosting. Still, I think it’s got great potential for empowering non-technical users to dip their toe into content-sharing via the web. You can learn about Opera Unite and download the preview at unite.opera.com. In the course of checking out applications for BlackBerrys, I ran across this remote-posting tool. Let’s see if it can work from the Web, and then from a BlackBerry. I don’t have kids and I rarely go on long road trips, so I’m probably the last person in the country who would blow $1299 to put an AT&T CruiseCast antenna on top of my aging Honda Accord. But if you’ve got the money (and a preinstalled rear-seat entertainment system to hook the antenna signal into), the system and its $28-a-month service are now available. Announced late last year, CruiseCast delivers 22 channels of broadcast-like satellite TV and 20 more of music via an antenna “the size of a child’s bicycle helmet,” RaySat Broadcasting Corp. CEO Winston Guillory Jr. told a web conference this morning. RaySat, AT&T’s partner in the service, developed much of the technology involved. Cruisecast antenna on top of a Blazer SUV. You can buy the antenna and have it installed through a network of resellers, including the big Crutchfield audio-video chain. Guillory says it is either bolted on to a roof rack if your vehicle has one, or attached via a mechanical mount. The channel lineup includes some names you’d expect for the type of passenger that typically sits in a back seat: Disney, Discovery and Cartoon Network for the kids, ESPN and a couple of other sports channels for the older kids. Also on board are CNN, MSNBC and Fox (for center, left and right-oriented news); Adult Swim, USA and Sci-Fi networks (which I actually would watch); and AccuWeather (I have no idea who watches weather programming on a regular basis, do you?). You won’t necessarily be getting the same versions of these networks as you would from your regular TV carrier. Several are the mobile versions created for cell phones. I’m curious as to how well this system will work — and how it will compare to the less expensive MediaFlo-based competition coming from Audiovox. Guillory said one big advantage of CruiseCast is buffering technology RaySat developed that is supposed to keep your programming going even when you’re out of satellite signal range (like in a tunnel or forest). I’m thinking this means that the programming-even the news or sports-isn’t exactly live, or how could it be buffered? I’m also thinking that this isn’t the best of times to be launching such a high-end service. I mean, who travels so much that they need a $28-a-month service to sedate, er, entertain the kiddies? It’s telling that today’s web conference was originally set for Monday-and rescheduled because the organizers realized that most reporters who normally cover these things would be busy covering GM’s bankruptcy. As I’m writing this on my notebook, I’m intermittently checking e-mail, answering instant messages, tweeting, and sending Facebook updates. That’s a lot of windows: Wouldn’t it be nice if I could take care of all these things within one easy-to-use application? Lars and Jens Rasmussen, the brothers behind Google Maps, thought so too–and the powers that be (a.k.a. 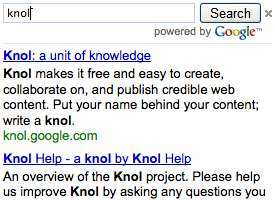 Sergey Brin) at Google believed in the concept enough to give them a team in Australia to develop it over the last two years. Today, at the Google IO developers conference, the Rasmussen brothers and lead product manager Stephanie Hannon previewed the results of their labors: a browser-based communication and collaboration platform called Wave. It took them a good 90 minutes (the entire day-two keynote) to show off Wave’s many capabilities, but at its most basic level, it’s a cross between e-mail and instant messaging client. If the person you’re communicating with is online, the communication becomes a two-way IM chat; if not, your message is waiting for them when they log on. The IM functionality has a very neat aspect that alone sold me on the concept: As you type, each character is sent in real time, so that I can even “interrupt” you by typing back before you complete your sentence. I also liked Wave’s ability to let you admit third parties to your conversation–and a playback feature that lets them see the messages they missed. But wait, there’s more. Waves can include images, videos, even maps–making Wave a document creation tool, too. And multiple users can edit waves in real time, with tracking a la Word revision mode–powerful collaboration features. Because Wave is browser-based, you can use it from in Web-enabled phone (there was a brief demo of this). And because Google is open-sourcing what Lars Rasmussen described as “the lion’s share” of Wave code as well as its protocols, developers are free to create their own Wave clients and servers that can still communicate with other Wave clients and servers (much the way e-mail works). All this makes Wave a candidate for all sorts of uses, including forums, wikis, bug-track systems (Google I/O is a developer conference, remember) and anything that you might now be managing via, say, Yahoo Groups. The Wave demo earned a standing ovation from the developers at this morning’s keynote. Sadly, however, Wave is still at least a few months away from even a beta public release: Right now, all you can do is sign up to be notified when it’s ready. In the meantime, you can read Lars Rasmussen’s post about Wave on the Google blog, or if time is no object, watch video of the keynote. If I need to figure out how to get somewhere, I can use Google Maps on my iPhone. But what if someone else needs to figure out how to get to me? Sure, I can spend a few minutes on the phone describing my whereabouts or giving directions. But unless I can easily pinpoint my location in a couple of words (e.g. Moscone West), Zos Communications makes it so much easier with a free application called Zhiing. 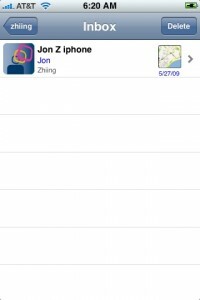 Available for Android, BlackBerry, iPhone, Symbian and Windows Mobile handsets, Zhiing lets you send your location info to another handset (or a Zhiing-enabled location based service) as easily as you would an SMS message. The recipient with a Zhiing client sees a message in their Zhiing Inbox; others simply get an SMS. Either way, you get a link to whatever map your handset supports (via a browser if need be) and the option of written directions from your location (Zos plans to offer a premium version that will add voice directions for hands-free navigation). A Zhiing in your inbox shows who's sending their location and a thumbnail map. 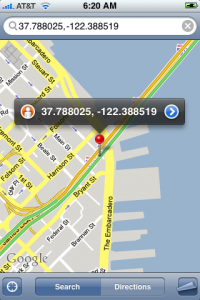 A Zhiing map shows your location using coordinates--and a much more user-friendly pushpin. What’s really impressive about Zhiing is that while it requires GPS, it doesn’t rely on it solely to establish your location. Zos has partnered with Skyhook Wireless, a company whose XPS technology uses GPS, Wi-Fi and cell-tower data to determine your whereabouts. That means you can run Zhiing indoors, even when there’s no GPS signal in range. Being able to give friends and family members instant maps and directions can be useful, but Zhiing could become even more useful if the platform is taken up by companies whose services involve knowing your location. I liked the example Zos CEO Jon Ziskind gave me of how Zhiing could make it much easier to get a cab to your home: You wouldn’t even have to call the cab company–you’d simply Zhiing ‘em with your request. Zos says emergency workers are already using Zhiing to locate people in need of help. Given its platform-agnostic approach, Zhiing seems to have a lot going for it. Check it out when you have a chance. You may not know me, but if you’re interested in personal technology there’s a decent chance you’ve run into my work before: I was an editor at PC World for the last 12 1/2 years, and before that covered technology for the L.A. Daily News, which syndicated my work everywhere. Last week I was shown the door along with a dozen of my colleagues (some of whom had been at PC World even longer than me). But writers write, so I’m going to be scribbling about stuff that interests me here (and hopefully elsewhere). I’ll be writing about cell phones, networking, interesting Web services, HDTV, and more. I hope you’ll visit from time to time as I build out this site. Meanwhile, I’m looking forward to my new adventure. 22 processes generated in 0.099 seconds.